The PowerLung Sport provides a serious workout at a high level of resistance. It users the optimum in isolated threshold resistance strength training. Who gets the most benefit from PowerLung Sport? People whose occupations, or vocations, require strong breath control activity such as those who act, sing, play brass and woodwind instruments or are public speakers. PowerLung does what wind sprints, breath control, yoga, pilates, or deep breathing exercise can not do. 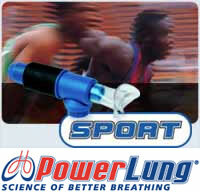 PowerLung strength trains your breathing muscles so they can meet the demands you place on your respiratory system. PowerLung makes any breath control activity or exercise more effective. Each PowerLung model comes with CD-ROM with training video, user guide, handy carrying case, and PowerLung Power Washe.